It’s that time of the year again. Many have brought a new four legged household member into their homes and with them comes joy, fun and a whole sleuth of responsibilities. Whether this is the first dog or you have already owned a dog before, things may be a bit different this time around. Here are some tips on how to enjoy each other’s company and getting the best start in your life as a dog owner. – Trade your hand/leg/foot with a suitable toy for your dog to chew on. As sharp as they are, puppy teeth are not quite as hard as adult dogs’ teeth, so things like hard bones (always raw!) are not a good fit – neither are raw hides or Nylabones. Plush toys can be great, just know, that you will have that stuffing flying around soon – also be careful to supervise the party, so your little one doesn’t swallow the squeaker. – Help soothing those teeth with some treats. Frozen carrots, stuffed and frozen Kongs (natural yogurt is a great and inexpensive stuffing), frozen watermelon… it not only helps with the teething pain, it also keeps the pup busy for a while. – Start training! If your dog is in a sit or a down, it won’t be able to bite you. Carry treats with you and use those to either gently guide your pup into a sit, then reward, or capture the moment, when your dog sits by itself and reward that. Have your dog sit for everything – food, toys, attention and soon, that sit comes naturally as an alternative behavior. We’ll go over some other great ‘tricks’ for puppies below. – Whatever you do, stay calm. Yelling and screaming is either enticing your dog to play the fun ‘I’m going to catch and bite you‘ game or have your pup fearfully cowering in a corner, being afraid of you. Both are potential outcomes, that we want to avoid. Inflicting fear or even worse – pain – can alter your puppy’s mental growth at that delicate stage and you might end up with an aggressive or fearful dog later on. So just say no to kicking, yelling and screaming. It isn’t effective. Instead redirect calmly and reward positive behavior. – If you have young kids, things can be a bit tricky, since it’s so much fun to romp around with a dog, but this may also trigger the play biting. Kids may not necessarily understand, that this is an involuntary behavior from the dog and, especially, if they are little, may get hurt. If your dog has no issues with kids, there is no need to separate them, but you always have to closely supervise the play and remind kids to stay calm. Throw a toy or treats instead of running around with the dog. Jumping up on people is a similar behavior as the biting. It comes naturally for the dog, especially a puppy. Some people encourage it, some don’t want it to happen. It certainly isn’t funny, if a dog jumps on a small child, elderly person or simply a stranger. Here’s where a good, solid ‘sit‘ comes into play. Again, if your dog sits, it can’t jump. Work on that sit and reward good behavior. Make sure, you work on that outside of your house, too. Consistency is important. Invite a friend over as a ‘stranger’ and work on that sit and not jumping with your dog (maybe provide a glass of wine or some cookies for your friend). Don’t kick your dog or have a ‘stranger’ kick your dog. As your dog is already super excited, yelling and screaming will likely make it worse, too. Ask your friend to calmly ignore the dog until the dog sits. It may take some time and many repetitions, but it’s the start of a good solid obedience foundation, without risking fear or pain. Many people can’t wait to start exercising with the dog – especially, when getting a dog in December, we want to extend our New Year resolutions towards our dogs and start that morning run with our four legged friend. After all – a tired pup is a good pup. While the latter is certainly true, you may want to take it slow. A dog’s growth plates (the area of growing tissue near the ends of the bones on each end of the bone) don’t close until around 1.8 year old, depending on the dog’s size. Smaller dogs typically are all grown a bit earlier than medium or bigger sized dogs. While the growth plates are still closing, heavy exercise is not a good idea. This means no forced cardio, no forced running and no forced jumping or any high impact activity. It is one thing, if the puppy decides to have the zoomies and zips and jumps around the backyard or the house, but having it jump over hurdles or taking it running next to your bike can seriously injure your dog and affect its health as an adult dog. There are many studies supporting a risk of dysplasia and CCL tears in puppies, who have been exercised too young. This does not mean, that you have to wrap your dog in soft cushion and place it in a crate. Some exercise is of course great for any age! And we still want that tired puppy after all. You can (gently) play a good game of tug, throw the toy and have supervised puppy play dates with other dogs in similar age, size and energy level. There are different opinions about taking puppies on walks. Short walks, about 5 minutes for every month of its life, about twice a day is a good rule. However, there is also the risk of Parvo, a particularly nasty and often deadly disease. So while walks around the house are probably ok, I would recommend against taking your pup to a public park until it is fully vaccinated against Parvo. A game of chasing the laser pointer is also not recommended. Studies suggest, that the frustration of never being able to catch that laser light can mentally harm a dog and lead towards anxiety behavior. It can also harm a dog’s eyes. While physical exercise is great and needed, most dogs also need mental stimulation. You won’t believe, how fast a puppy tires out after playing some hide and seek games with its favorite toy or treat throughout the house (though you want to avoid the stairs). Or do a simple and fun 5 minute obedience session, followed by some play time. Your pup will be tuckered out in no time and you will have done another step towards a good obedience foundation. There are some dog sports that can be started with a puppy already, for example K9 Nose Work. Here are some useful games and tricks to start your dog with a great and positive foundation of obedience. You won’t need anything other than a treat pouch and some high value treats (meaning, your dog will stop in its tracks to get that treat) preferably small and soft. I have found, that often tiny pieces of hot dogs or cheese work great. Keep those sessions short and fun. Don’t start, when you are already frustrated, in a rush or angry. You need to be calm and have fun. After all, that’s why you got a dog in the first place, isn’t it? Young dogs can’t concentrate for a long time, just like babies and toddlers. You can do several sessions a day, but don’t do them longer than about 5 minutes. Yes, you will need a lot of treats in the beginning, but will soon start to wean them off, or, at the very least, not need to give as many. Once your dog reliably offers the correct behavior for a command, don’t put your hand into the treat pouch before the behavior occurs, once the dog offers the correct behavior, that’s when you can get that treat to reward your dog. That’s how you will start to wean your dog off treats (although I still like to reward dogs with treats unexpectedly). Getting your dog to focus on you helps not only to keep your pup out of trouble and makes walking on a lose leash easy, but also give you the opportunity to give a command while having your dog’s undivided attention. Anyone, who has ever tried to recall a dog while its chasing a rabbit down the hole, knows how important focus is. Grab some treats and call your dog. The instant your dog looks at you, give a treat. 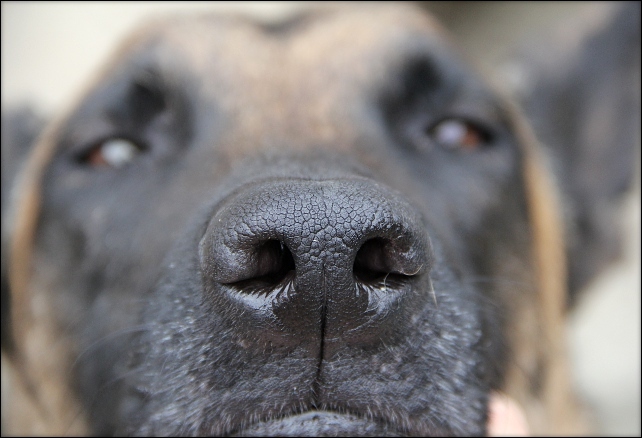 Make sure, your dog looks at you (eye level) and not at the treat. If your dog happens to look at you without you calling your dog, still give a treat. Any focus on you should be rewarded. While ‘sit‘ doesn’t seem to be a super exciting trick, it is extremely useful. Making that sit a natural behavior keeps your dog from biting and jumping and other mischief. Use treats to gently guide your dog into a sit, only reward with said treat when your dog is in a sit position. Be careful not to sound like a broken record (‘sit, sit, sit, siiiiiit, sit, siiiiiit, sit!’) but to say the command only once. Try to get the behavior first before using a command at all. Have your dog sit for everything it wants – food, play, attention until it sits naturally, if it wants something. Once your dog sits reliably for the command, wait until it is in the sitting position before reaching into your treat pouch to give your dog a treat. Use a towel or a dog bed for this nifty ‘trick’. Guide your dog on the towel or dog bed and reward once it is on there. The preferred position is a down, but I wouldn’t worry, if your dog just sits there. Give a couple of treats about 1 second apart, so your dog stays on there. Then increase the time between giving the treats, slowly. When your dog catches on and stays a couple of seconds between the treats, take a step back, then return to the ‘place’ and give another treat. Gradually increase the distance, but always go back to reward the dog, so your pup knows, that the treats will keep coming at the ‘place’. Eventually start sending your dog to the ‘place’, again by gradually increase the distance and reward, once your dog sits or downs on the towel or mat. If your dog got this down, you can start moving the towel or the mat and continue that same exercise. This way, you can take the ‘place’ with you, if you go for a visit somewhere else. This exercise is great for dogs, who want to be first at the door to greet (or bark at) visitors. It is also great for interrupting that biting and jumping, but don’t forget to keep those sessions short and fun. Eventually, you can give your dog a longer lasting treat on the ‘place’, such as a stuffed Kong or frozen carrot/apple/watermelon, etc. 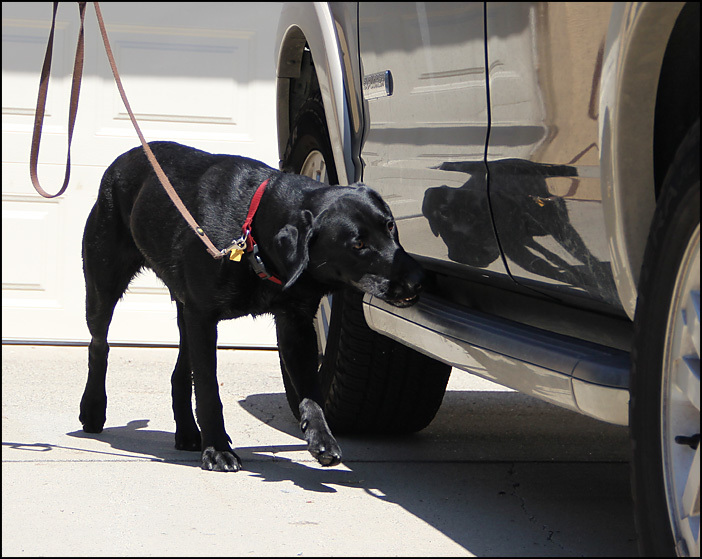 This is the first step to one of the most important commands, the recall. Don’t ever chase your dog, if your dog runs from you, or scold it, when it comes back to you – most dogs have lots of fun, running from you – or they get scared, knowing, that you will chew them a new one, once you catch them. Instead start early and start at home. Call your dog’s name and as soon as your dog takes a step towards you, kneel down, throw a big party and give your dog a treat. You’ll never see a dog running towards you faster, than when you act as if you haven’t seen your dog for a year (and reward with a treat or two). Once your dog comes to you reliably (keep those treats coming), you can take your party outside. Start in your backyard first and repeat. Don’t call your dog, if it is checking out the neighbor’s cat or is otherwise distracted. Once your dog is reliable in your backyard, you can finally work outside of the house. Use a long line for safety, but try not to put any pressure on the leash. It is a good idea to teach your dog to relax in a crate. If your dog ever has an emergency, where a vet stay is needed, it’s nice, if the crate is already perceived as a safe place. Never use a crate as a punishment. Make it fun, feed your dog in the crate and leave the door open, so the dog can go in and out. Eventually, you can close the door for a second, open it again and give your dog a treat. Close the door again and slowly increase the time. After a while, you can start walking away from the crate with the door closed, come back, open the door and give a treat again. Crate training is a great after-exercise or after-training activity, when your puppy is tired already. Get your dog in the crate, give a stuffed Kong or another longer lasting treat and let your dog relax in there. In most cases, you can also close the crate door. Try to go back and open the door before your dog starts whining. Never let your kids go in the crate with your dog. The crate should be a safe place for the dog to go in and get away from anything, that bothers it. It is always a great idea, to take some formal training, even if you already are dog experienced. You can usually get some good input and ideas and it’s a great social event for your dog – but especially if you have issues, that go beyond of what we were talking about here, don’t wait. Seek out a trainer, who has widely acknowledged credentials (e.g. CPDT) and/or titled sport or working personal dogs. Training doesn’t necessarily always have to be purely positive, but should be mostly. Prong and e-collars have no place on puppies. In fact, they are illegal in many countries for a reason. The least intrusive methods should be used, but your trainer should be flexible to accommodate what works best for you and your dog. Training isn’t instant gratification, it takes time to lay a good foundation. But it should always be fun for you and your dog. Use common sense and leave, if you find, that you and your dog are not having fun or if your dog is being jerked around. Also, watch the weight of your dog. More than 65% of dogs in the US are overweight. It’s not just unhealthy, it will shave off about 2 years of your dog’s life. This is a good overview on how your dog should look like: https://oregonvma.org/files/Purina-Dog-Condition-Chart.pdf – a pet dog should be around 5, a sport or working dog around 4. Dogs should never ride loose in a car. It is dangerous for the driver as well as for the dog. In case of an accident, a dog could not only be seriously injured, but also jump out of a broken window and run into the street. Keeping the dog secured either on a harness and seat belt or in a stable crate in the back ensures the safety of the driver, the dog and everyone else in the car. – Most of us live in an area with leash laws. This means, that by law, our dogs are on a 6 foot leash at all times. We can agree or disagree with this, but it’s the law. 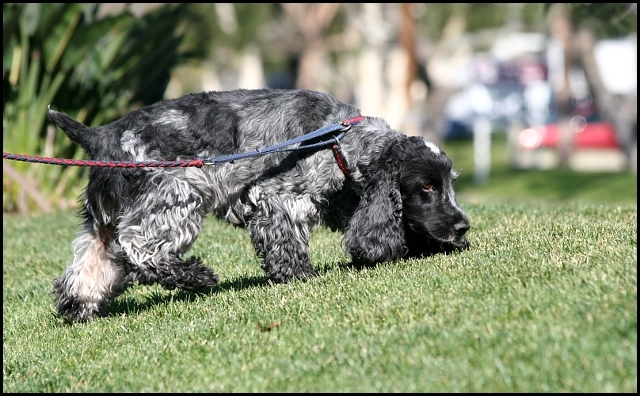 If something happens and a dog is either on a longer leash (e.g. fully extended flexi leash) or off leash, then that dog owner is at fault. – Not every dog is fond of other dogs, just like not every person likes other people. Don’t let your dog run up to another dog without asking first. It is also polite to reel in your dog to your side when passing someone else, with or without dogs. Some people are very afraid of dogs. They may have had bad experiences in the past, dog bites or just plainly don’t like dogs. While this may be difficult for many of us to understand, it is certainly within their rights. So keep your dog at your side while walking past anyone, no matter, whether your dog is social or not. It’s not just good etiquette, it goes a long way to co-exist with non-dog owners and dog owners, who have dogs, that are not social. – Pick up your dog’s poop. This is the law and it is also helps preventing the spreading of diseases like Parvo. Plus, those, who have kids, know, that they inevitably will find and step into left over poop. Not fun. – Don’t let your dog pee on your neighbor’s front lawn. It seriously can destroy the grass and will annoy your neighbor. Find other pee stops somewhere a long your walk (oh, and don’t just dispose poop bags in your neighbor’s trash can without asking). – Do not let your dog chase any wildlife, not even those pesky Canadian wild geese, at the very least outside of your backyard. Not even on a long line or when there’s no chance, that your dog will actually catch one. Or if you think, your dog only wants to play with them. Above all, have fun with your dog!